While for-profit senior living providers are positioning themselves to thrive in the crucial years ahead, many not-for-profit providers are simply trying to survive the next decade. And there’s a good chance that many of those nonprofits could end up as acquisition targets, according to Tim Myers, CFO and COO at Rockville, Maryland-based senior housing and care provider Ingleside. Myers spoke with Senior Housing News for its Bottom Line interview series, which connects with senior living CFOs to gain greater insight into today’s financial risks and opportunities, and to learn how these leaders are helping guide their companies into an exciting but sometimes uncertain future. Myers previously worked as CFO for a different senior living nonprofit — Kennett Square, Pennsylvania-based The Kendal Corp. — for eight years until joining Ingleside in 2015. 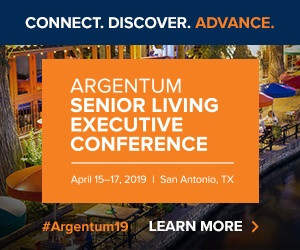 Before that, he spent a decade as CFO, COO and partner for New Life Management and Development in Mount Laurel, New Jersey; and worked as a director of special projects for the former Marriott Senior Living Services before Sunrise Senior Living acquired it in 2003. For Ingleside, the future is clear: find a way to have a seat at the proverbial table, or risk being on the menu. The senior housing nonprofit has three life plan communities in the D.C. area, as well as a development company and an at-home arm. The organization is also seeking creative ways to add more housing and services, and is investing more in technology while also seeking solutions to the difficult D.C. labor market — perhaps by drawing more workers from overseas. Would you say it’s true that senior living has gotten more operationally and financially complex over the last few years, and if so, how has that placed new demands on you as a CFO? It’s interesting. You almost have to split it into two pieces. The independent living has not gotten more complex from a regulatory standpoint, but it has from a consumer standpoint. The health care piece, particularly skilled nursing, is exponentially more difficult than it used to be. People have said there’s more regulations around skilled nursing than there are around nuclear power plants. In October, they’re going to change reimbursement system. So, yeah, it’s much more complex to give high-quality nursing services and have any hope of a reasonable margin. The added labor [issues], particularly here in the D.C. area, one of the struggles we have is, as D.C. gentrifies, a lot of the folks we typically would draw from to serve at our communities are being pushed farther and farther away. So it’s difficult to attract them. How did you end up at Ingleside and did you ever envision yourself working in senior living? This is the only industry I’ve ever worked in. I started when I was 12 cleaning grease pits, and then I started volunteering and working in the dining room through high school and college, and right out of school started in the industry on the consulting and accounting side. What brought you specifically to Ingleside? Where I previously worked [at The Kendal Corporation], we had a number of communities. The opportunity to grow rapidly wasn’t really there, and that’s what I really like, to have an operating background, finance background, development background. All of that combining together to build and expand is perfect. And Ingleside is poised to do just that. Our industry is like any other, you either have to grow or you’re going to be taken over, it’s as straightforward as that. Especially in the D.C. area, there’s so much opportunity here. So, Ingleside was a natural fit as I looked to exit Kendal. It was progressive, growth-oriented, hopefully at the end of the day, an acquirer, not an acquiree. That’s something many other nonprofits are worrying about, too, either being at the table or being for dinner, so to speak. That’s partly why I think many of them are choosing to form partnerships or joint ventures. It’s so fascinating. The loss of identity and control are always front and center. And the economies and just the business reality of having to get together is often lost, which is unfortunate. That’s where the for-profits have a huge advantage over us, because they don’t get carried up over that kind of thing. When you started with Ingleside, where was the organization at, and what were your main priorities? The main priority then and now is we need to mind our knitting. In other words, we are a provider of services to seniors. That is our reason for being. We need to make sure we’re doing that as well as possible. The last three and a half years have been about getting the efficiencies out of that process, so that as we go forward, we have something to offer. If we’re looking to joint venture or partner or buy or whatever, we have to bring something to the table. And that something is location, it’s also expertise. We have a fabulous IT department. The smaller organizations trying to develop their own IT, it’s just ruinously expensive. So, that’s one of the differentiators for us going forward, the ability to utilize data. It’s really taking Ingleside from where we’ve been in the past and helping turn it toward a more data-driven, results-oriented organization. It’s bringing together the three communities and then three other organizations, a foundation, an at-home program, and a for-profit construction and development organization. Making things uniform, making things efficient, starting down the road of aggregating resources, that’s really what we’ve been working on. People say, ‘we’re the best and we give great, quality care.’ One of our next big subjects is, how do we prove that? My resident outcomes might be fabulous, but I need to be able to demonstrate that, to myself and to the other side, and also our resident. That will help in marketing and partnering with others. Add to that, we issued half a billion dollars in debt two years ago. That’s just getting ready to come online this year. That’s been keeping us all up at night. Can you talk about one or two or three moments during your time with Ingleside, or in your time working in senior living, that were moments of challenge or change, and how you worked through or are working through those challenges or changes? Coming back to the most recent one, it’s labor. There is so much opportunity, particularly in D.C. itself, but access to quality, motivated and consistent employees is exceptionally difficult. There’s a lot of other people vying for them, and their challenges to get here are greater and greater. So, we’re struggling with that now. A lot of our focus has been on recruiting, and even more on retention. We’ve recognized that, if we can retain these good people, then our lives are going to be easier. But that’s really been the biggest piece. We’re beginning to look abroad to go directly for other countries. Whatever your political persuasion is, immigration is going to be key to serving the senior population. Looking at the number of folks over 70 coming, and then the number of people available to work, it’s a big mismatch. So, that’s really the way we’re approaching that, to go directly to the source. That’s aggregated by the current political climate, which is unfortunate. Bt unless we can solve that, we’re going to have a great deal of difficulty with labor in the future. When you say you’re going to the source, what do you mean? When I was an executive director in California years ago during the nursing crisis in the early ‘90s, we started communicating with The University of Manila in the Philippines. We were able to identify a large group of Filipino nationals who wanted to come to the U.S. and train as doctors or RNs. So, we brought over 40-something RNs [from] the Philippines. The deal was, we housed them, and they operated as CNAs while they were going to nursing school in the U.S., because their RN license in the Philippines doesn’t transfer over. It was a win-win. Our quality care went through the roof because we had RNs doing CNA work, and it was a win for them because they got help with their green cards. We also paid for their schooling. Not that I would do exactly that again, but that’s the concept, finding some partner abroad with goals that perfectly fit with yours. If Ingleside did this today, where abroad would you look for workers? Many of our employees in D.C. are from different African countries, typically West African, but not exclusively. Just like D.C. itself, our employee pool mirrors the folks who live here. So probably that would be where we’d look. Again, this is completely agnostic. It’s finding the right fits of things that are important. How are you seeing resident preferences change over time? You see transition from the conservative, don’t need a lot of amenities Depression-era folks into the, I want choice, I want convenience, I want ease of access to services, and I don’t want to pay for it. It’s interesting. When you get into the financial piece, the question is, do you invest your money in physical plant? Do you invest it in services outside your physical plant? Or how do you meld the two of them together? The at-home is absolutely the key to the future, that ability to service folks outside your four walls. What needs to happen to get younger seniors to move in to senior housing, and how do changing preferences play into that? Move-in preference is geographically oriented. You get some geographies where they wait until the last possible minute, and some where they don’t. I think in Washington D.C., they’re more amenable to living in senior living communities because it’s very much like the condo or apartment they live in currently. You get out to more rural areas, it could be the opposite. So, again, geography-oriented. Where we do see the generations coming having similarities is in that they don’t want a meal plan that’s 30 meals a month. They want choice, and they want to be able to have much greater access to amenities in the city. They don’t want to wait for the bus, they want to drive themselves. Or, for example, we’ve done a lot of work with Uber and Lyft. So that the traditional transportation system doesn’t serve this new generation as well as it served the old one. You also see a lot more social interaction in the younger generations. You also see them a lot more tech-savvy and a lot of their communication comes through technology. We have Alexa at all of our communities, which has been a great help for the newer independent living folks. But where we’ve seen a lot more immediate advantage is in the nursing centers. You get folks with low vision issues, folks who can’t hear and see as well, or who can’t manipulate a keyboard as well. Alexa has been fabulous. There are still growing pains with it, but it’s those type of technology-oriented solutions that the new generation really is going to embrace and expect, whereas almost have to you force it on the current generation. How are you thinking costs/expenses for 2019? Are there items on the balance sheet that are of concern, or areas where you expect to make significant investments, or achieve any cost reductions? And are margins under pressure this year? The margins under pressure are skilled nursing. There are some areas where there’s still a great demand for nursing services where the demand is far in excess of capacity. This isn’t one of those areas, unfortunately. The unfortunate part of skilled nursing is, the majority of reimbursement is government-related. And the government can see what’s coming, that they’re not going to be able to afford the current way of doing things. So, the pace of change, and the general sense that things are going to get worse, not better, as far as reimbursement goes. You add into that the labor issues, the legal issues, and skilled nursing is very challenging. We’ve seen, for example, at one of our communities in particular, the average length of stay is a third of what it was three years ago. The acuity levels are getting higher and higher, which is broadly consistent with the whole system. So, margin-wise, that’s going to be an ongoing challenge. Moving forward, on the balance sheet, we have about $600 million in physical plant, that’s about our gross property value. So, reinvesting that every year to keep it up to snuff is a substantial cash flow commitment. One of the things we’re looking at is, to what extent do we fund that physical plant versus how much money should be used to invest in at-home services? [That could mean] traditional private-duty to bringing skilled care to folks at home to using our for-profit development company to build assistive devices for folks. That calculus back and forth is difficult, particularly with such a huge fixed asset load. Fortunately, most of it is new. But that’s the biggest challenge for the balance sheet, how we spend that cash flow. Cost-saving wise or labor-wise, our average increase in costs and new monthly fees has been around 3% to 3.5%. I expect that will continue for the near-future. I don’t see our cost of providing services any higher than that in the short-term. If we’re not able to deal with access to labor, then that absolutely can start to get out of hand. So, that’s the biggest worry, coming back to labor. How’s the availability/cost of capital at the moment, do you expect any tightening of the debt or equity markets in the near term? I don’t. We’ll go through our ebbs and flows of the capital market. I don’t expect another ’08 again. We’ll see dips and we’ll see it tighten and loosen. I don’t think it’s going to be a problem. Particularly, if you have a good story and idea, I think the capital will be there. Access will be good. I think the cost of capital will continue to be fairly good. I don’t think that’s going to be our industry’s issue. I think it’s going to be on the operating side, not on the capital side. What’s your take on M&A and development at the moment? On the nonprofit side, it seems like consolidation is the name of the game right now. Our for-profit cousins tend to focus more on the A then the M. We tend to focus almost exclusively on the M, whether it be two folks joining together or one absorbing another or whatever. I think absolutely, you grow or die. It’s going to be a reality. The Ziegler 200 … in 10, 15 years you’re going to struggle to fill it up to 200. Part of it is the backbone to support operations, whether it be IT, HR, finance. Leveraging that overhead across a system being able to provide consistency and uniformity, quality monitoring, that’s all key, it’s just difficult to do if you have a 100-bed nursing home somewhere or a smaller community. I think it’s going to drive folks toward getting together. I think what you’ll see is, folks who can do A well and folks who can do B well are going to start getting together. You do at-home, I’ll do nursing. I think you’re going to see a lot more of that through matter of necessity. I predict that in 10, 15 years, I don’t know you’ll have more than 200 or 300 providers of any consequence. How is Ingleside thinking about growth or evolution in the next three to five years? The opportunity to greenfield develop is A, so limited, B, it’s so expensive and it takes so long to bring about. But we’re really opportunistic there. There are a couple opportunities in D.C. where there’s mixed-use projects going on. Being part of one of those is one of our goals. What we’re really looking to do is branch out into the middle-income market. The three communities we have, two of them serve wealthier individuals. The one in Virginia [is] closer to upper middle class. We’re really looking to serve the middle market. That’s through a combination of acquisition or more likely, merger with someone who is doing it already. Maybe opportunistic purchasing of for-profits who perhaps are in trouble or got into this a real estate play but really don’t want to operate, long-term. It’s just partnering with other folks who are building other things that we could be a natural piece of. That’s really the big focus going forward. For the at-home program, private duty is what we currently offer. We don’t offer the medical model. [But] the medical model, with our at-home, is a natural fit together. The hub and spoke around our communities, folks who need more intensive nursing case, would ;d be served within the four walls of our nursing center. It’s so much easier to partner or acquire someone who does the medical model than it is to try to develop it. Those are two examples of where we’re looking to grow. We’re no different. We’re going to merge and were going to change over the next 10 or 15 years like the rest of the industry. As has been widely reported, we may be seeing Medicare Advantage start to cover some senior living services, is that on Ingleside’s radar? Any plans to play in the MA space? There are no plans currently in place to do that. We’re more IL-oriented, currently. Where we really look at opportunities from CMS to change the way they do business would be around assisted living, particularly around memory care. Our focus going forward is less on traditional skilled nursing and assisted and more on memory care. Both of the new communities that we’re expanding have centers for healthy living, which really focus on the memory care piece. The ability to provide quality memory care services in and out of the community, we’re absolutely convinced that’s a need everywhere in the country. What about technology? I know Ingleside had a big push to roll out Amazon Alexa. Tell me about how that’s come along and what your plans are for the future with regard to technology. When I got here, our tech spending was under 1% of our expenses. Our target now is between 3% and 5%. So, we’ve gradually been moving that up. We’re around 3% now. One of the issues around tech is underinvestment in it. It’s difficult to have a robust technology background if you’re not appropriately investing in it. Technology is a tool. It’s nothing more than that. I’m not going to simply put technology in a community and expect that resident care will increase. Where we see tech being helpful is, we’re a people business. The technology is a way of being able to report and track and manipulate the data of what’s been done so that we can improve our quality care. Technology will never replace that person-to-person contact, and that’s not what it was designed to do. What it’s designed to do is give more options to folks that we’re dealing with when we are with them and when we’re not with them. It bothers me when people think a technology solution is going to make everything better. It doesn’t work like that. Data collection and analysis has become a powerful tool for driving business decision making and strategy, what types of data/metrics are you most interested in analyzing, and is this informing your leadership as CFO? The first one is marketing. Understanding who we’re serving is absolutely critical, particularly as we try to change. We assume that everyone wants what we’ve been providing for years, but it’s really understanding what does the next generation want and how they want it delivered. Those are key bits of data that are going to be incredibly instructive as to what we do strategically, particularly as we look to grow and expand and change our operating model. That’s one place where data is going to be tremendously helpful. The other side of that is, how are we delivering our services and how are we able to track outcomes? It’s so difficult to track whether someone feels better or whether they are achieving their goals. It’s easy to track falls and ulcers and CMS data. But that’s not really demonstrative of success. It can be, but typically it’s not. It’s really using technology to understand what you want to do. If you’re a 95-year-old and your granddaughter is getting married and you want to walk down the aisle, that’s your goal, so how do we help get to that? That data can help clinical outcomes. But that’s the more elusive type of data because it’s … so individualized that drawing on data and organizing and drawing it from multiple points becomes more and more difficult, which is why the backbone of what we’re trying to develop is so critical. Mission versus margin is a theme in senior living and maybe a challenge. Do you ever feel like you’re fighting to protect margin while others in the organization are freer to focus on mission? How do you define a healthy margin in this business and ensure that you’re striking the right mission/margin balance? You get less and less people anymore that are myopic around margin or mission. You’re starting to see among management, the board, even the residents, a greater understanding that we’re a business, and we’re here to do good, but we need to do well. So you have less people sitting on the poles of, mission has to exclude margin, or vice versa, and more around, how can we meld them together? It’s going to be interesting. The feds and the states and localities are all going to start coming after not-for-profits more aggressively. It’s just inevitable. They need money, they need to make sure that perceived abuses aren’t going on under their watch. It’s going to be far more interesting once the government begins to put into rule or regulation or law, what does it mean to be a not-for- profit? I think we’re a few years away from that type of specificity. But then that margin and mission will begin to have a different set of discussions.